The delegation of our plant visited all ADEX exhibitions in Baku and continues this tradition, as participation in these events helps to identify current situation and get acquainted with new products of the MIC market. 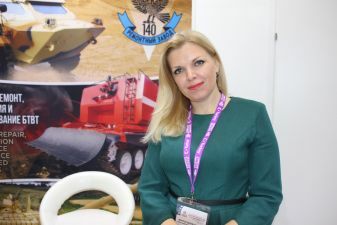 High-quality products of the 140 Repair Plant, such as armoured vehicles, tanks and other special equipment, are known throughout the world, and we value our reputation. During the exhibition, representatives from Azerbaijan held substantive negotiations, the results of which we expect will lead to establishing close cooperation. At our stand at ADEX 2018, we presented models of the armoured vehicle Cayman, designed for conducting reconnaissance and sabotage actions, patrolling extensive areas, and escorting humanitarian columns during various peacekeeping operations around the world. This armoured vehicle is assembled from completely Belarusian components. We also demonstrated a model of the ГПМ -72 caterpillar fire engine for extinguishing fires and carrying out rescue operations at arsenals, warehouses and storage bases for ammunition and explosives. This fire-fighting vehicle is equipped with an aqua-mast with a remote control panel. Together with BelTechExport, we presented a new development - the Т-72БМЭ tank equipped with a sighting complex with a thermal imaging sight and reinforced armour. The tank can fire all types of 125 mm shells, including guided missiles. It has a digital VHF radio station of the latest generation BARRETT-2082 +.